Congratulations to the 2019 Élan Award winners! Click here to find out who won! 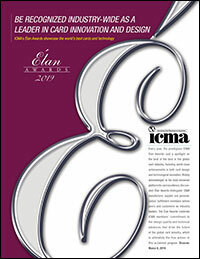 Every year, the prestigious ICMA Élan Awards cast a spotlight on the best of the best in the global transaction card industry, honoring world-class achievements in card design, technological innovation and other categories that establish the global vanguard for card manufacturing excellence. Widely acknowledged as the most renowned platform for card excellence, the coveted Élan Awards distinguish ICMA manufacturers, suppliers and personalization/fulfillment members before their peers and customers as industry leaders. The ICMA Élan Awards are open to members only and are selected from hundreds of entries from North America, MEA, Asia, Europe and other areas of the world. Winning an Élan Award offers significant promotional opportunities for high-profile industry recognition and visibility. The Élan Awards will be presented at the ICMA EXPO awards dinner in Orlando, Florida on Tuesday, April 2, 2019, to winning manufacturers, personalizers, suppliers and their customers. With the exception of the People’s Choice award, an independent panel of card industry experts recognized one winner and two finalists for each award category. Secure Payment Cards: These include Financial, Retail or Gas/Petrol branded cards from secure issuing organizations like VISA, MasterCard, American Express, Discover, UnionPay or Retailers like Macys, WalMart, or Gas/Petrol companies like Shell, Exxon, BP. The card can be magnetic stripe and/or smart chip with debit, credit or prepaid as long as it bears the branding logo of a recognized secure issuer. Loyalty, Promotional, Gift Cards: Includes cards for airline, hotel, car rental and grocery loyalty programs. Also, gift cards with a prepaid value usually initiated at check out. Cards must be printed on card stock of 24 to 30 mil thickness and can be magnetic stripe or smart chip. ID and Access Control Cards: Includes government-issued cards like healthcare, drivers license or national ID. Also includes cards for access control such as door keys, access ID badges or cards for entry/access. Cards can be magnetic stripe or smart chip and may or may not have photo identification. Unique Innovation: Most innovative technical achievement in card functionality or Personalization/Fulfillment product or service (multi-application, biometric, optical, alternative material, environmentally friendly, other innovative cardholder features) that demonstrates novel, unique or expanded functionality in response to customer application requirements. Entries must be card industry based products or services. Personalization & Fulfillment (P&F) Product, Service or Project: P&F bureaus can enter a new card-based product, service or project that was launched into the card market this past year. It could be a unique and attractive card package that was personalized and fulfilled to the cardholders of a specific secure or non-secure market and issuer. Best Supplier/Vendor New Product, Service or Innovation: Associate members can enter your own product, service or innovation that was utilized in the card and/or personalization & fulfillment industry this past year. This could include items such as materials, equipment or services. People’s Choice (selected by ICMA EXPO delegates): Attendees at the EXPO selected their favorite Card from all of the entries received in any of the above categories. These entries will be displayed face-up without identification of the ICMA member entrant.